Oneida's Arbor Rose® flatware pattern is designed with smooth flowing scrolls accented with a prominent rose bud creating a warm, traditional design in quality 18/10 stainless steel. The finish has a bright, highly polished, mirror-like surface. 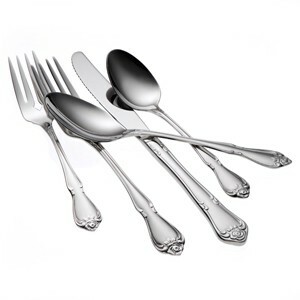 Pair this decorative flatware pattern with floral themed dinnerware or simple white tableware. Long lasting, durable restaurant flatware you can count on from Oneida.